Pain is designed to protect and detect. It also teaches us to respect our bodies and to let us know when we neglect our health. By listening to the pain and learning from it we can connect to what is the true cause of our pain. The worst thing we can do is to reject pain and its attempt to communicate and point us in the direction of a problem. When we reflect on how God created our bodies and that our bodies always have our best interest in mind, we can begin to understand some of the true reasons for pain. 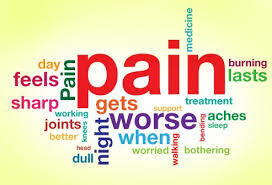 Pain can inspire us to inspect our lifestyle and health habits. Take time to today to appreciate pain – don’t just cover it up or ignore … pause to find the cause of your pain and correct the cause.